If your waking hours are anything like mine, many if not most are spent in attending to ordinary things. Although you might wish to be contemplating the meaning of life or encountering something out of the ordinary, groceries need to be bought and e-mails answered. Bills need to be paid. Whatever your spiritual aspirations, ordinary life assumes the foreground. At first glance, Zen practice might seem a welcome escape from the daily round. At its deeper levels, Zen is indeed concerned with the alleviation of suffering, the cultivation of compassionate wisdom, and the “Great Matter” of life and death. Cloistered in their mountain monasteries or secluded in their urban centers, Zen masters and their disciples may appear to have risen above the quotidian fray and to have transcended the concerns of everyday life. This emphasis on ordinary things and common actions, so conspicuous in the literature of Zen, may be partly a matter of convention, but it is also grounded in Zen teachings, particularly those pertaining to the ethic of care-taking, the practice of non-discrimination, and the aspiration to enlightenment. In ways not immediately apparent, acts as seemingly trivial as picking up one’s coat support those long-term aims. Years ago, when I was preparing for my first stay at Dai Bosatsu Zendo, a Rinzai Zen monastery in the Catskills, I called ahead to ask what I should bring with me. “Expendable work clothes,” a resident monk replied. And upon arriving, I understood the relevance of his advice. 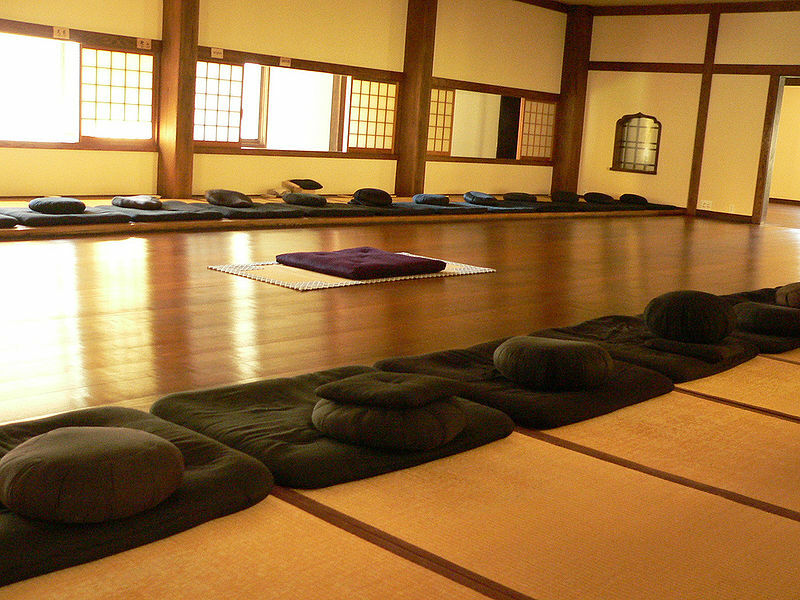 Dai Bosatsu Zendo, like most Zen centers and monasteries, exudes a spirit of cleanliness and order. Windows have been washed, mats and cushions vacuumed, stair steps scrubbed by hand. Cups, bowls, incense sticks, and other functional objects have been meticulously placed, with ample space around them. By their quiet presence, those objects reflect the mindfulness of the residents and their abiding attention to ordinary things. By treating their surroundings in this way, Zen practitioners cultivate an attitude of respect and a habit of wholehearted regard. Beyond that, “work practice,” as it is called, serves a deeper purpose in Zen training. Whether as monastics or as lay practitioners like myself, Zen students are encouraged to cultivate the “wisdom of non-discrimination,” which is to say, to set aside such conventional dualities as “high” and “low,” “worldly” and “unworldly,” and “sacred” and “profane.” In Zen teachings, if not always in practice, raking sand and managing a complex budget, cleaning toilets and studying sutras are deemed to be equally important activities. Distinctions between manual and intellectual, blue-collar and white-collar labor do not apply. By recognizing the illusory and relative nature of those concepts, we can fully embrace whatever task we might be performing, however menial or distasteful. In Jane Hirshfield’s words, we can choose to “make the unwanted wanted,” infusing new life into a conventionally devalued chore. By so doing, we can also strengthen an aspiration toward enlightenment, which for the Zen practitioner resides in everyday life. To give full attention to one’s work is a virtue in itself, but in the context of Zen practice, it is also a way of opening our minds to a reality masked by ordinary thought. According to Zen teachings, common objects, deeply regarded, can reveal the impermanence and interdependence of all conditioned things. A cup is indeed a cup, but it is also an event in the selfless, dynamic web of life. By caring for that cup, and by looking deeply into its impermanent nature, we can free ourselves from the habit of grasping, having realized that ultimately there is nothing substantial to grasp. And by stopping to contemplate both the cup and the “non-cup” elements–soil, water, air, the labors of a potter–of which it is made, we can penetrate the illusion of separateness, which divides subject from object and the mind from the material world. Should that realization occur, suddenly or gradually, ordinary things will no longer be merely ordinary, nor our labor merely labor. As ever, thought-provoking. But one question: ‘disposable’ work clothes? Something I think about often while in Korea, and in general in life. Many days are not going to be grand Asian adventures. Many are just going to be about cleaning my small apartment. And that is enough. Dr. Ben Howard was one of my English professors at Alfred University, where I graduated in 2003, and continues to be one of my biggest inspirations in Buddhist practice. I too questioned that phrase. “Recyclable” or “reusable” might be more in keeping with Zen practice. I suspect that the monk’s point was that the clothes may no longer be presentable after a few weeks’ work. Thanks for your comment, John. If you can find Marian Mountain’s book THE ZEN ENVIRONMENT in Korea, you might appreciate her discussion of housecleaning as practiced in Zen. I trust that you will indeed have adventures in Asia, though they may be rather different from Thomas Merton’s. I remember you as an adventurous student, who managed to maintain several days of Noble Silence within a noisy college setting. Best wishes for your life and practice.